A cluster of wonderful islands with green hills and few houses. The islands are close enough together so you can see the next one over and then some. Beautiful clear and turquoise water. Great snorkelling. White sandy beaches, with or without palm trees. Balmy days and cool nights. Colourful people and a relaxed atmosphere. Primitive beach bars with the sounds of reggae. 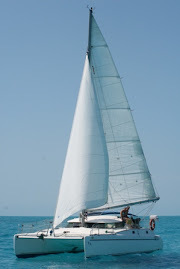 Steady trade winds that make for wonderful sailing, every day! 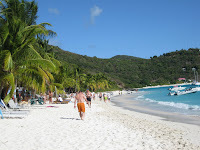 We have reached the British Virgin Islands, one of the best sailing grounds in the world. It is easy to see why. With the huge amount of visitors coming for this very reason, sailing the islands, mostly on a chartered boat, some things are turned into negatives for us, the cruiser. Every popular anchorage is full of mooring balls, making it almost impossible to anchor. There are ways around it, but those consist of using two anchors and showing a lot of patience, tolerance, persistence and being inventive. The unconventional way of anchoring might also include a line to shore, being less picky about your spot, re-anchoring a few times, taking two hours to get settled, using lots of chain because the water is very deep or cheating a little bit with the length of it. Another advantage of the high level of tourism here is that food and drinks in (beach) bars are extremely expensive. Nothing wrong with having a cocktail in our cockpit and watch the scene, or grabbing a drink and finding a nice spot on the beach to watch sunset ourselves. Luckily, some places do have Happy Hour and we know how to find them. 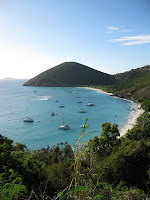 We started our exploration of the islands in West End, on Tortola, where we checked into the country and met our friends Ed, Emily and Steve from Luperon. It was great to catch up on each other’s lives and stories. We would see everyone multiple times in different places over the coming month. 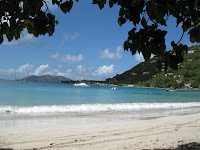 Cane Garden Bay, also on Tortola, was a place we both liked very much. The atmosphere and the beach were wonderful, the bars affordable and the live music was great. Steve had the use of a car and took us tfor a pleasant tour of the island. The wind in the anchorage was very funky. Irie did all kinds of weird things and we felt we couldn’t push our luck much longer, so we sailed to Jost Van Dyke. 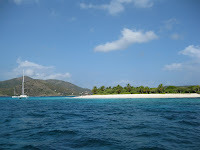 Our next stop was The Bight on Norman Island, famous for the Willy T, a bar/restaurant on an old ship. We picked Ed and Emily up and sailed around for a couple of hours. Just for fun! That had been forever. We also stopped to snorkel in a cave. It was a great afternoon. After visiting the Willy T and a day of recovering, we moved around the corner and anchored a few days in a quiet bay without charter boats. 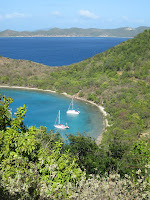 A walk over the hills provided us with great views of the BVI and our anchorage. On Peter Island, we found Little Harbour very pretty and relaxing. Since the bay is very deep, people drop their anchor, back up towards shore and tie one or two lines to trees or rocks, to keep them from moving and bumping into other boats. It felt as if we were parking Irie in a garage. Dead Man Bay was also a beautiful setting, but we could only enjoy the view for a couple of hours, since the anchorage was very uncomfortable. Virgin Gorda is famous for the Baths. We skipped that tourist attraction for now and stopped in a couple of other places. The island didn’t do much for us. Gorda Sound was filled with expensive yachts and fancy resorts, not wanting Darwin on their beach. 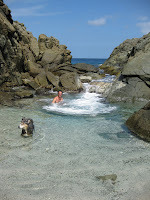 We will go back next week to visit the Baths with Karl, who will arrive on Tortola shortly. He will spend ten days with us on Irie (a few here in the BVI, then an overnight trip to St. Maarten and the last days over there), so we’re all in for another adventure! Greetings from Calixta! Enjoying your blog! How was the importation of your dog into the BVI's? I'm going round and round with all the red tape. We don't have your email address, so I hope this message gets to you this way. To get the dog into the BVI, you need to be up to date with the rabbies vaccination, you need a tether for that rabies vaccination, you need a current health certificate (we got ours from a vet in St. Thomas, which then had to be signed by the woman vet of the agriculture department in the North of the island, a hassle)and a micro chip. You also need to contact the department in the BVI who then faxes a form which you have to fill in and fax back. That gets you an import permit, which they fax to you or -what we did- we asked the vet to bring this permit when he checked our dog upon entry. If you have the permit, it's not sure a vet actually checks your dog upon entry. If you don't have the permit yet, a vet meets you on shore in West End (Soper's Hole) or Road Town. We checked in in West End. Everything went fine and the people were professional and friendly. Not sure how it happens in Road Town. My guess is the same vet shows up there. We heard these were the only two places in the BVI you can check in with a dog. Hope this helps! I'll email you with my address. Maybe we'll catch up with you. I've been in contact with Gypsy Cat.